The habit of eating apples every day, it is very beneficial for health. Especially effective for preventing heart disease. This is apparently because apple has the effect of lowering cholesterol, especially the bad cholesterol. Benefits of apple to prevent heart disease, it is very helpful for women who are already in menopause. Women who have menopause is at higher risk of heart disease and stroke. In the study proved, the woman for six months regularly eat apples every day, cholesterol levels 25 percent lower, than those who did not eat apples. Research published in the journal Academy of Nutrition and Dietetics, showing after three months. Total cholesterol levels of apple-eating group, declined to 9 percent, and the levels of bad cholesterol decreased by 16 percent. After six months, the decline was much sharper, namely total cholesterol fell by 13 percent, and bad cholesterol up to 24 percent. For comparison, in this study the researchers also analyzed the respondents who ate plums (prunes). In this group also decreased cholesterol but only slightly. The researchers concluded that consumption of apples (two medium size) every day for three months can lower cholesterol. 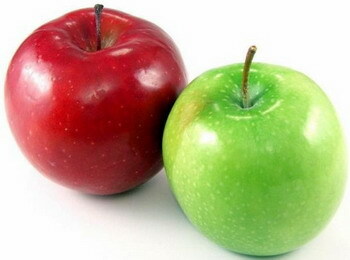 Previous research in Poland mentions regularly eat apples can keep a person from colon cancer. Another study revealed that, apples are more effective for lowering LDL cholesterol levels compared with drugs that contain polyphenols. While polyphenols, it is one of the compounds in apples. In this study also found that it takes only a month to get the result. Cholesterol can also trigger inflammation and tissue damage, while interacting with free radicals. Apples here working to produce antioxidants that can fight free radicals. Prof. Robert DiSilvestro (lead researcher, from Ohio State University) said that they have data on the effect of oxidized LDL with just one apple a day, for four weeks. According DiSilvestro, apples are significantly more effective in lowering LDL being oxidized, as compared with other antioxidants such as green tea and tomatoes. In this study, they studied the patterns of health of active smokers aged 40 to 60 years, for four weeks. 16 participants were given a red apple, 17 other participants are equipped with polyphenols, and 18 were given a placebo containing no polyphenols. The researchers found no effect of a placebo for reducing LDL levels. While the effect given by the polyphenol supplements do not work as well as apples. In addition to providing benefits to decrease LDL, the researchers also found that the antioxidants in saliva, have implications for dental health. For additional information, you can read the apple nutrition facts article.